Need help? 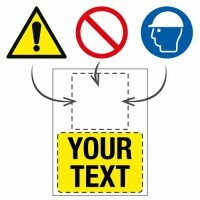 Why do you need to display PPE signs? When personal protective equipment or safety clothing needs to be worn our safety clothing (PPE) signs are a great way to get the instruction across. These can be used in all kinds of places, although you’ll naturally want to put them in a highly visible location with our sign fixings where required for maximum impact. The signs can help you comply with health and safety regulations and come in a range of materials and sizes. For more information take a look at our FAQs section and buying guide. Why Do You Need to Display PPE Signs in Your Workplace? Management of premises and operations are responsible for enforcing the use of safety clothing and personal protective equipment where appropriate, such as high visibility workwear and head protection. While training and policy should ensure employees are aware of these practices, it is important to back up the message with appropriate signage, which is where safety clothing (PPE) signs come in. These signs act as a visual reminder to employees or visitors to ensure they are properly dressed and adequately protected when working in areas that could present a risk, helping to ensure health and safety compliance as well as contributing to a reduction in risk of injury in the workplace. Safety clothing (PPE) signs are instructional signs that give workers and visitors a clear and concise message about what general protective clothing or equipment should be used in any given area, one of the most commonly seen PPE signs instructs employees to wear eye protection at all times. Our range of safety clothing (PPE) signs range covers the needs of a number of industries and environments, from construction sites and factories to kitchens and laboratories and covers a diverse range of subjects, from safety footwear to ear protection. You can use PPE signage in work vehicles, for example to instruct drivers and passengers to fasten their seatbelts while on the move. This type of sign is designed to be used in any area where staff or visitors should be wearing safety clothing or using safety equipment to comply with health and safety requirements, such as those requiring you to wear respiratory equipment. Safety clothing signs should be posted at all entrances to areas where there are specific clothing and equipment requirements, and should also be posted within these areas to ensure employees and visitors remain aware of the need wear or use these safety precautions when within the zone of potential risk. Our range of safety clothing (PPE) signs cover the needs of many industries and include eye protection signs, ear protection signs, hand protection signs, foot protection signs and head protection signs. We also have signs that instruct employees and visitors when it is necessary to wear high-visibility or protective clothing, as well as signs instructing the use of safety equipment such as masks, respirators, face shields and safety harnesses. Designed to comply with health and safety legislation, our range of signs use instantly recognisable standard designs, many of which feature both verbal and pictogram prompts to help ensure the safety message is adequately communicated to everyone who sees them. These signs can be used in conjunction with our hazard signs when necessary; often the need for protective clothing is required around dangerous or hazardous materials. Other safety clothing (PPE) signs in the range incorporate the recognisable stop sign, a range of which are found in our prohibition signs category, along with verbal prompts to use safety clothing and equipment to prevent people from entering areas if they are not sufficiently protected. We also have a selection of signs available that use nite-glo glow-in-the-dark technology to ensure better visibility in areas of low light, helping ensure the message is communicated effectively any time of the day or night. What Safety Clothing (PPE) Signs do I need? Your type of business and the business practices will influence the need for safety clothing (PPE) signs in your premises. You may be required to ensure safety clothing and equipment is used by health and safety legislation, so it is important that you familiarise yourself with the requirements before installing signage to ensure it is effective. Before ordering safety clothing (PPE) signs, think about the equipment staff and visitors are expected to wear on your premises - create a list by area and ensure you have signage for each piece of clothing and equipment required. 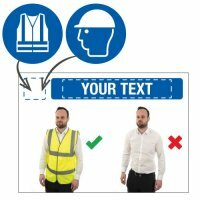 Where should Safety Clothing (PPE) signs be displayed? Signage requiring the use of safety clothing and PPE should be displayed at access points to each workspace and within those areas as well. Signs should be mounted in a visible position - you may need multiple signs to ensure they are seen by people approaching from any direction.